To Panic or Not to Panic: Think the Bay Area’s Real Estate Market Has the Jitters? The 2018 Pacific Union Real Estate Economic Forecast called for market “normalization,” with cumulative home price growth of 10 percent over the next three years. The market is still on track for this appreciation. Stock-market volatility is primarily driven by oversupply of oil in the global markets. Volatility will persist a little longer until markets adjust. China is doing just fine — still growing at over 6 percent, with jobs and incomes increasing steadily. U.S. economic fundamentals are still strong, with exceptional job growth. Consumers are happy, but businesses are concerned about the strong dollar. We are seeing higher activity in lower price ranges helped by low mortgage rates and job growth. Higher price segments may see some impact later this year if the stock market remains at today’s levels. At the 2018 Pacific Union Real Estate Economic Forecast in November of last year, we talked about what’s to come in the next couple of years for Bay Area housing markets. One main theme that emerged was “normalization” of the technology growth in the Bay Area and its potential impact on home sales and price appreciation. The conclusion suggested that housing markets are expected to normalize, with home prices and sales continuing to grow at a steady but slower pace. Home prices are expected to grow about 10 percent cumulatively over the next three years. Since the forecast in November 2015, financial-market volatility has sent shivers down our spines, leading to many questions about what’s to come. What Is Causing the Stock-Market Volatility? Most of the volatility in the financial markets is coming from falling oil prices. During the first three weeks of January, oil-futures prices declined 27 percent. Over the last two years, the price of a barrel fell from over $100 to $27. That’s pretty staggering! The main reason for the drop in oil prices is the oversupply of oil in the global market, as well as an oil-production boom in the U.S. 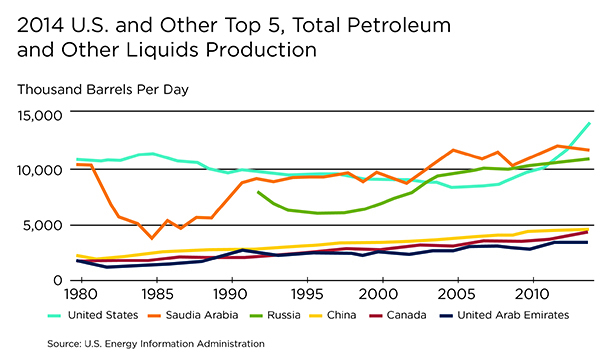 In the chart below, the U.S. (the blue line) is now the largest producer of oil globally. Production of oil has increased to an all-time high, growing by over 1 million barrels of oil between July 2014 and July 2015. At the same time, the other oil-producing countries have not scaled down their production as a result of the oversupply, which is how they usually control prices. OPEC is in the process of vigorous negotiations over limiting production in an effort to stop oil prices from continuing to stumble. However, competition for influence and market share has grown fierce for OPEC countries, which is keeping their oil production elevated. Hence, the oversupply is expected to continue over the next few years, and markets will have to go through a period of adjustment. However, there is something to be said about fast money and technological advancement, which have allowed investors to move monies instantaneously on any spook. For example, anticipation over higher Federal Reserve rates led those looking for a quick return to move their monies into banks in anticipation of higher rates. However, since the rates have not budged and have actually fallen, the money moved as quickly out of the banks. This is another cause of volatility. As a result of this volatility and fears over poor economic results in emerging markets, demand for U.S. currency denomination (for example, treasuries) keeps growing, causing the dollar to strengthen. A strong dollar is bad for our trading partners and it further perpetuates slower growth abroad, which can in turn have a bad impact on the U.S. economy. The good news is that the U.S. dollar has begun to weaken slightly, which may help dispel some fears. Some have argued that oil oversupply is due to a slowdown in demand for oil from China. However, Chinese consumption has been on a solid upward trend for several decades. And though the pace of annual increases has slowed in last couple of years, China continues to consume increasing amounts of oil. Keep in mind that China was going through a major industrialization process over that period, and it is natural that consumption would eventually slow as industrialization reaches a certain point. China is still growing strong though, at a staggering rate of 6 to 7 percent. Also, the main reason for the slowing of consumption of oil is that the Chinese economy is moving from mainly relying on construction and industrial growth to relying on service-industries growth. Chinese people are richer than they were before, and their consumer spending is showing positive signs, hence supporting the service-industries growth. Income and job growth are solidly moving upward. Despite volatility, recent U.S. economic data points to continued growth ahead. Most importantly, job growth remains strong. The last jobs report showed the unemployment rate falling below 5 percent (considered full employment) and more people participating in the labor force. Also, people are working longer hours and are more likely to quit a job in pursuit of something better. This means that the pressure on wages that John Burns discussed at the November forecast is coming to fruition. 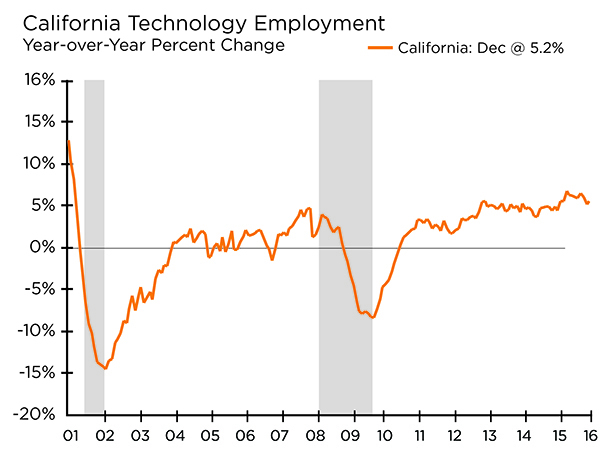 California continues to grow employment at one of the fastest paces in the country. With 60,400 jobs added in December, job growth in 2015 reached an amazing 459,400 net new positions. This marks the fourth year in a row that California has added more than 400,000 jobs and also marks the largest job gain of any state. 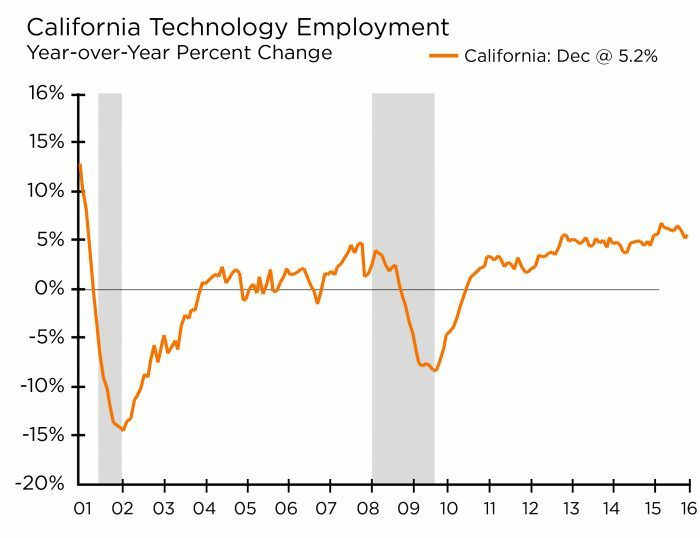 The chart below shows the year-over-year changes in the tech sector, which is still growing at a healthy 5.2 percent. Business and consumers have different perspectives on the state of the economy, though. Consumer spending, which accounts for 70 percent of GDP, showed impressive numbers in January. Lower oil prices and lack of inflation are helping with retail sales growth and not just with the purchase of new automobiles. There are also signs of income growth, and mortgage rates continue to remain incredibly low. This is all good news for U.S. consumers. Businesses, on the other hand, have been more concerned about the future. A strong dollar has not been helpful for U.S. businesses selling abroad. With less demand coming from overseas and volatility in the market, businesses are showing less confidence and anticipate slowing of job formation. However, it’s hard to draw any conclusions about the entire year ahead based on data that comes in January, and particularly if the winter was harsh in some parts of the country. Generally, many economic indicators are reported at the national level, yet indicators that have been disaggregated by regions of the country have shown the West outperforming other regions for several years now. Housing is still a really bright spot in the economy, both locally and nationally. Where Do We Stand in February 2016? In the Bay Area, we continue to see some strong numbers for January. The California Association of Realtors’ January report showed single-family home prices for the region continuing to soar at double-digit rates year over year. Pacific Union real estate professionals report similar price increases, with average prices 13 percent higher among properties sold by our firm when compared with the same time last year. Sales of single-family homes have also shown advances, growing by almost 7 percent from last year, according to CAR. Pacific Union professionals have had a better year with sales and sold 15 percent more homes this January than last one. Also, many clients are facing delays related to new Consumer Financial Protection Board regulations, with sales being pushed to spring months. Still, we cannot generalize across all price segments. Preliminary data shows that homes priced below $1.5 million are seeing much more activity than homes priced between $2 million and $5 million. Affordability remains the main concern in the Bay Area, and homes in the lower price range are being buoyed by very favorable mortgage interest rates. In fact, what’s still giving everyone a headache is the lack of inventory. Pacific Union listings are down 9 percent for the first 50 days of this year. We are in the third year of extremely low inventory in the Bay Area, with markets like Santa Rosa showing less than half a month of supply. Pacific Union professionals, however, suggest that spring may open some doors, with more listings in sight. Data on single-family permitting also suggests that we may be seeing more homes available for sale in the East Bay and San Francisco, with both areas showing more than a 23 percent increase in permits in December from last year. New permits in San Jose are much slower to catch up and have only increased 5 percent during the same time. At the 2015 forecast event, we also talked about “normalization” of IPO valuations and uncertainty of what will happen to increasingly unsubstantiated valuations. It is still very hard to predict where these “unicorns” are going to land. In other words, how much appetite will investors continue to have for “unicorns”? We do know that the stock market is down about 10 percent from last year. While the volatility in the stock market will probably persist a little longer, making it very hard to predict where it will stabilize, some correction has been anticipated for a while. The problem for the Bay Area stems from the fact that the housing market is relatively more sensitive to the stock-market-wealth effects than in other area of the country (previous academic research by Richard Green from University of Southern California has confirmed this). That means that if the stock market stabilizes at a lower level than last year, we may see some softness later this year. The softness will not be uniform across all price tiers, however, and will primarily impact sales in the range between $2 million and $5 million. Lower price ranges will continue to benefit from strong job growth, advantageous mortgage rates, and high demand among younger buyers in search for more affordable housing. Sales of homes priced above $5 million will also see a lesser impact, as the wealth among those buyers is more diversified and less reliant on the stock market’s movements. All in all, we are off to a solid start for the housing market in the Bay Area. Stock-market volatility will persist for a little while longer, but economic fundamentals remain strong for the region. Barring some unexpected market surprises, we anticipate to remain on track for 10 percent cumulative appreciation over the next three years, which certainly aligns with the idea of “normalization” when compared to the past several years. Selma Hepp is Pacific Union’s Vice President of Business Intelligence. Her previous positions include Chief Economist at Trulia, senior economist for the California Association of Realtors and economist, and manager of public policy and homeownership at the National Association of Realtors. She holds a Master of Arts in Economics from the State University of New York (SUNY), Buffalo and a Ph.D. in Urban and Regional Planning and Design from the University of Maryland. Previous PostPrevious Planning a Remodeling Project? Watch for Trouble Spots in Your Relationship.